This report, in addition to giving you the complete factory option list and door data plate info, includes a reproduction of your door data plate. You also get a reproduction of the window sticker and personalized production statistics that show how unique your car is. All of this is mounted behind a Ford blue matte board and installed in a 16" x 20" black frame. You'll even learn how many cars were made like yours! We analyze your car compared to similar models and then break down how many had your engine, your transmission, your paint color, your interior, and then your options until we determine how unique your car was. Usually you will discover no other car was made like yours. The Elite Report is printed in full color and is already framed. It will look great either hung on a wall or proudly displayed at your next car show. And, because we are licensed by Ford, you can be assured they stand behind all the information we provide. You will receive the "DELUXE REPORT" portion ONLY as a PDF via email in 10-14 days. You will receive the entire Elite Marti Report, framed and matted, when it is complete. Due to the high demand for these popular reports, the lead time for the Elite Marti Report for most VINs is four (4) months. 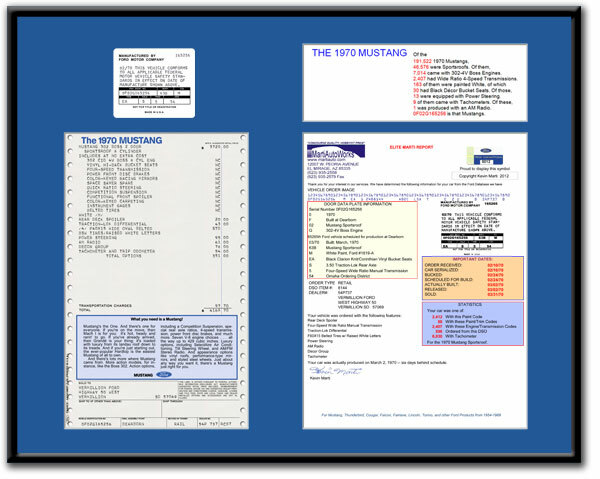 IF WE DO NOT have the Ford Original Invoice for your VIN, extra time will be required for research of content and layout for the window sticker. (See the ORIGINAL INVOICES tab under PRODUCTS to see if we may have the original invoice for your VIN). Lead times are estimated and may vary depending on workload and demand. See our Comparison Chart to determine which of the 3 reports is best for you. PLEASE NOTE: Due to the fragile nature of the Elite Marti Report, we are unable to ship Parts in the same package as the Elite Marti Report. We do not ship partial orders. Please place a separate order for Parts. DOUBLE CHECK THE VIN: We strongly encourage you to double check and ensure you are entering the correct VIN below. Entering an incorrect VIN can result in delay of your order or, should we produce a Marti Report and you determine it is for the wrong VIN, you will still be responsible for the cost of the Marti Report and will have to place a separate order for the corrected VIN. Price and Optional Addons are based on the selected vehicle. 1 - This appears on the door data plate. It is important to have if yours is missing. 2 - This appears on the door data plate. It is important to have if yours is missing. Also useful for knowing where the car probably spent its early life (like in the rust belt?). 3 - For those wanting to know the history of their car. 4 - Five general statistics about your paint, trim, engine, transmission, and DSO will be supplied. 5 - Several interesting statistics that apply directly to how your car was optioned will be supplied in addition to the general statistics. 6 - With the Elite report, all items are mounted in a 16" X 20" black frame with blue matte board, ready for display.